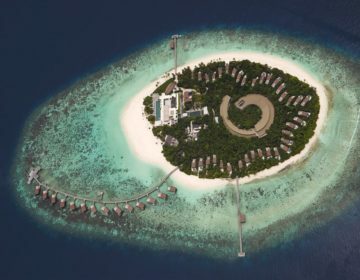 Part of the world-renowned resort group, the Coco Collection, Coco Palm Dhuni Kolhu is a luxurious boutique resort offering over-water charm and barefoot luxury. Surrounded by the stunning southern waters of the Baa Atoll UNESCO Biosphere Reserve, the resort is reached by a 30-minute journey by seaplane from Malé International Airport, which gives guests a bird’s eye view of the azure lagoons and curling atolls that are home to some of the world’s most spectacular reefs. The Coco Palm Dhuni Kolhu Resort embodies idyllic island living with rustic yet luxurious thatched villas either set amid the palms back from the beach, on the sand overlooking the lagoon, or on stilts over the water. Traditional craft blends with the ease of contemporary comfort to create stylish interiors with modern décor where guests can leave the everyday stresses of life are left behind and reconnect with nature. World-class amenities at the resort include a luxury spa and wellness center, several fine-dining and casual restaurants, cafés and beach bars, and an array of sports and leisure options. Guests can enjoy a variety of experiences from private sandbank picnics and dolphin watching cruises to local island visits and cinema-under-the-stars evenings. 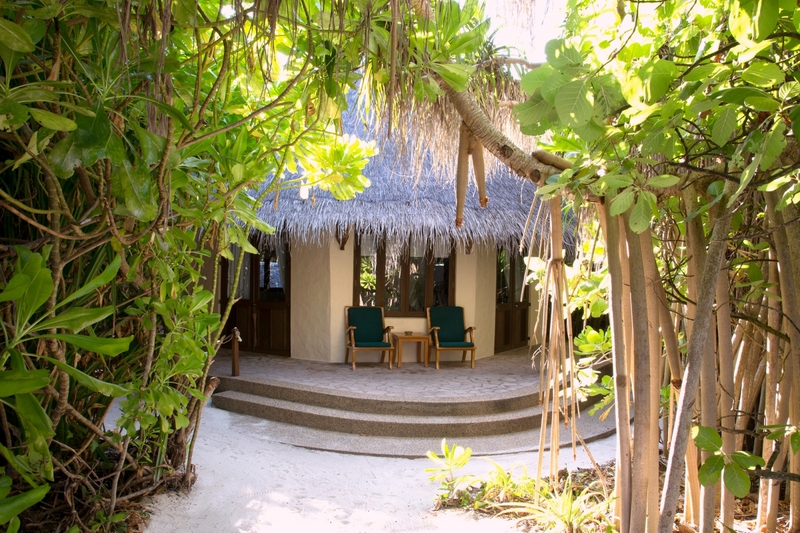 Coco Palm Dhuni Kolhu is dedicated to promoting and supporting sustainability, the local environment, and the Maldivian culture. The resort features an on-site water production and glass bottling plant, as well as a waste management center that recycles materials including aluminum, glass, and styrofoam. Plastic bags and bottles are banned to minimize waste and pollution. 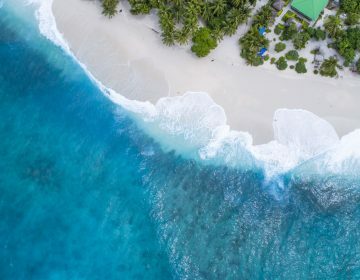 Coco Palm Dhuni Kolhu promotes marine conversation, and the resort is a favorite nesting site for the endangered green turtles. Dedicated marine biologists protect the eggs, monitor the nests for hatchlings, and relocate the nests to safer ground if required. The resort works in partnership with the Olive Ridley Project which helps to remove ghost nets and rehabilitate any injured turtles. 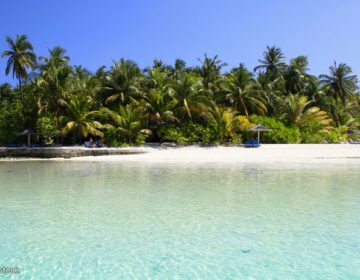 Coco Palm Dhuni Kolhu is the only island in the Maldives with a dedicated resident veterinary surgeon. Coco Palm Dhuni Kolhu features a variety of beautifully appointed villas, overlooking the lagoon, or floating over the water on stilts, each a sanctuary of luxury and comfort with awe-inspiring views of the lagoon or and the ocean. Surrounded by lush, tropical jungles with gracefully arching coconut palms swaying gently in the sea breezes, villas are available as Beach, Sunset Beach, Ocean Front or Deluxe Villas. Lagoon and Sunset Lagoon Villas are neatly perched over shimmering turquoise waters and exude relaxed sophistication with thatched roofs, timber latticework, white-stone walls, hand carved furniture, and deluxe facilities such as outdoor showers, and state-of-the-art amenities. Nine Ocean Front Villas line the fine white sand with beautiful lagoon and ocean views. The stylish beachfront retreats boast 87 square meters of space and feature high ceilings, luxurious king-size beds with mesh canopies, spacious seating areas with writing desks and dressing tables, and en-suite bathrooms with soaking tubs and walk-in showers. Private terraces have outdoor furniture and direct access to the beach, and modern amenities include minibars and high-speed wireless Internet. Nestled in lush tropical gardens, 23 Beach Villas offer 87 square meters of space and feature high ceilings, luxurious king-size beds with mesh canopies, spacious seating areas with writing desks and dressing tables, and en-suite bathrooms with soaking tubs and walk-in showers. Private terraces have outdoor furniture and direct access to the beach, and modern amenities include minibars and high-speed wireless Internet. Sunset Beach Villas are 87 square meters in size and feature high ceilings, luxurious king-size beds with net canopies, spacious seating areas with writing desks and dressing tables, and en-suite bathrooms with soaking tubs and walk-in showers. Private terraces have outdoor furniture and direct access to the beach, and modern amenities include minibars and high-speed wireless Internet. 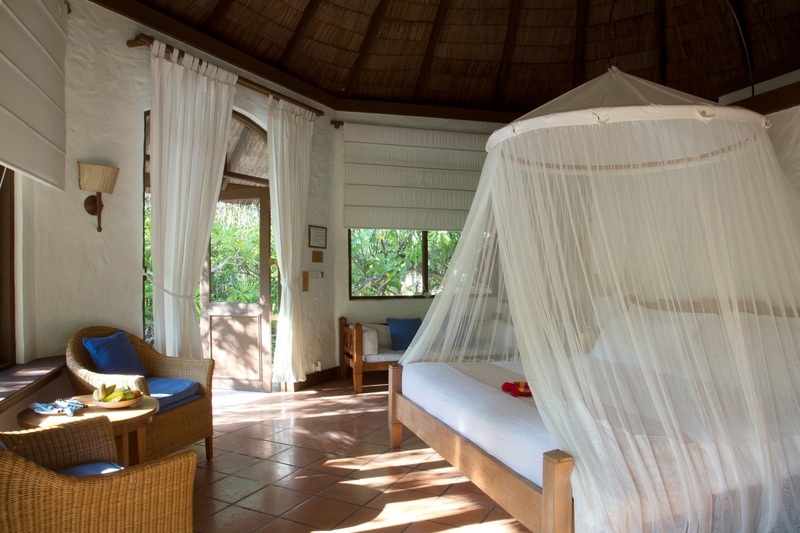 Surrounded by lush foliage and swaying palms, Sunset Beach Villas are sanctuaries of privacy and luxury. Situated on the east shore of the island, 27 Deluxe Villas offer the perfect location to soak up the natural ritual of the rising sun. Deluxe villas are 87 square meters in size and boast traditional Maldivian architecture and design with terracotta tiled floors, master bedrooms with king-size four-poster beds with mesh canopies, en-suite garden bathrooms with sunken baths and outdoor showers, sumptuous sitting areas with table and chairs, writing desks, and dressing tables. Expensive terraces have fresh-water swimming pools, sun loungers, and private paths to the beach. Coco Palm Dhuni Kolhu’s Lagoon Villas are located on the coconut palm leaf-shaped extension of the island’s North-Western tip and offer 87 square meters of luxurious space. Perched over the water and accessed by wooden walkways from the beach, villas offer absolute and unfettered panoramic views. Villas feature wooden floors, authentic Maldivian furniture, king-sized four-poster beds, en-suite bathrooms with Jacuzzis and walk-in showers, elegant lounge area and private sundecks with outdoor seating, sun loungers, and sunken fresh-water plunge pools. Modern amenities include minibars, espresso machines, and high-speed wireless Internet. Floating over the lagoon at the tip of the iconic palm leaf-shaped villa wing, Sunset Lagoon Villas are the largest and most luxuriously appointed villas on the island. 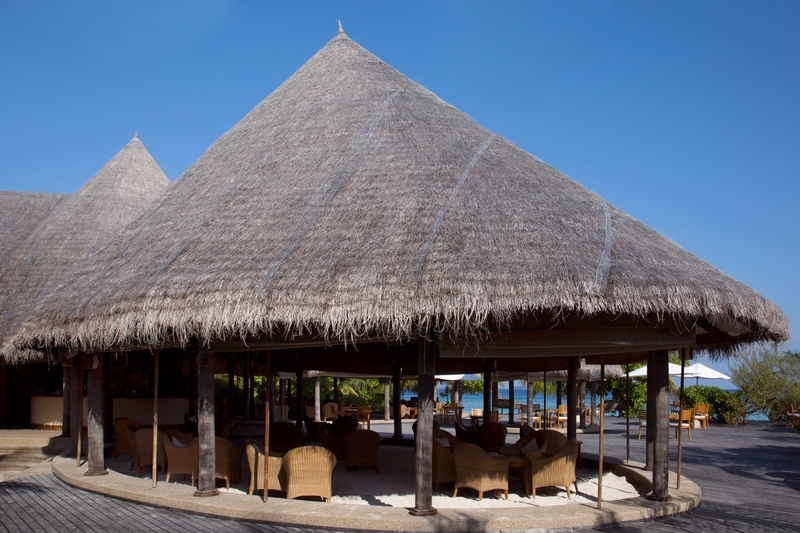 Boasting 154 square meters of luxurious space, the luxury hotel suites feature high, pitched thatched ceilings, separate living spaces decorated with traditional Maldivian artifacts, seating areas with sofas, and elegant en-suite bathrooms with stunning ocean views. Private decks have outdoor seating, sun loungers, and sunken fresh-water plunge pools, and modern amenities include minibars, espresso machines, and high-speed wireless Internet. Coco Palm Dhuni Kolhu offers a selection of dining options for guests wanting superb cuisine, expertly-crafted demonstrations, and world-class hospitality and service. The largest restaurant on the island, Cowrie is an airy and elegant celebration of globally-inspired cuisine, while Cornus brings the vibrant flavors of Asia to the Maldives. The Beach Bar is the perfect place for romantic sundowners, and Conch Bar offers chic shade, stylish refreshments, and gracious island hospitality. 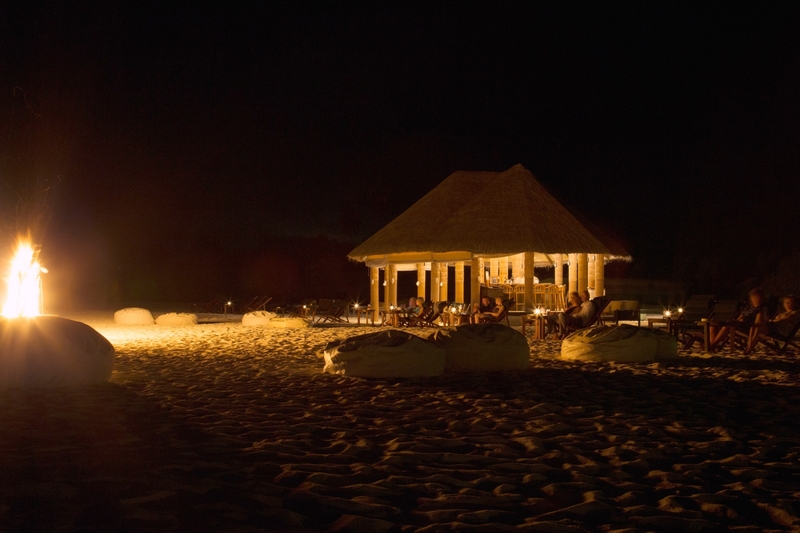 The Beach Bar is set on the island’s vast western beach and offers the ultimate sunset experience with the Indian Ocean stretching to the horizon. Surrounded by deck chairs and sunshades, the beach bar serves a menu of small plates and tapas-style bites and a curated list of libations including signature cocktails and fine wines. Nestled beneath the cool cover of a high, thatched pavilion with powdery white sand underfoot, Conch Bar & Café serves freshly brewed coffees, light lunches or handcrafted cocktails against a backdrop of awe-inspiring ocean views and live music. Set in the lush southwest tip of the island, Conch Bar & Café offers a menu of fresh salads, flame-grilled burgers, and Mediterranean pasta dishes, along with freshly-squeezed juices, crisp coolers, and signature cocktails. Cornus embraces the flavors, textures, colors and vibrant spirit of Asia with delectable dishes from India, China, Indonesia, Malaysia, and Thailand. Connected to the Beach Bar by a sandy pathway through the garden, Cornus is the perfect spot for a pre- or post-dinner drink. 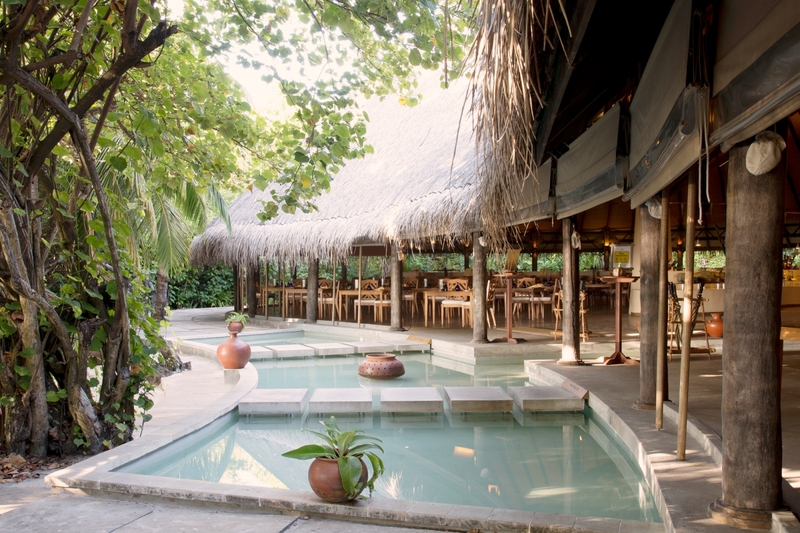 Tucked away in the deep green of the island’s flourishing tropical jungle, Cowrie is an elegant, spacious, and stylish spot that captures the essence of Maldivian hospitality. 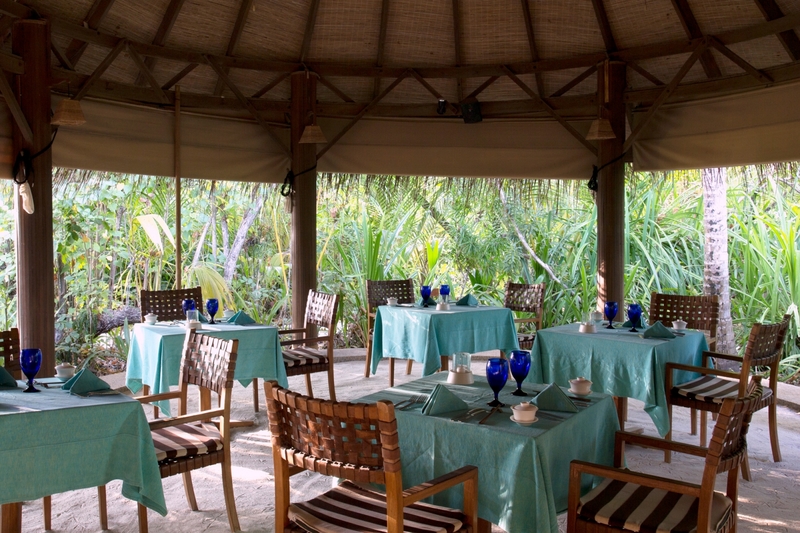 Open every day for breakfast, lunch, and dinner, Cowrie boasts a high, palm-thatched ceiling with open pavilion sides and serves delectable buffets for every meal. 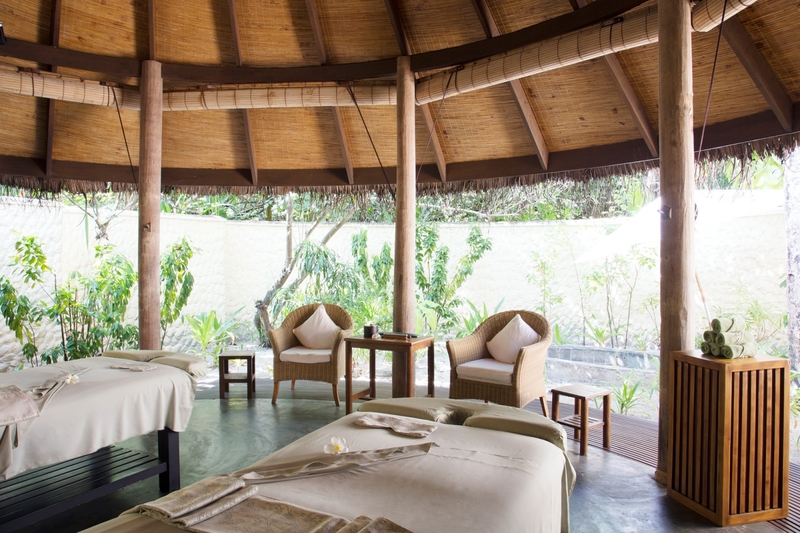 Coco Palm Dhuni Kolhu has a luxury spa and wellness center that offers an uplifting natural sanctuary that promises absolute relaxation and indulgence. The spa features five treatment rooms inspired by ancient Indonesian, Thai and Indian Ayurvedic techniques and uses the deluxe Thalgo range of products that are renowned for their use in thalassotherapy. The spa also features a fully-equipped gym and a chic yoga pavilion that invites the reconnection of mind, body, and soul. Coco Palm Dhuni Kolhu offers a wealth of both land and water-based activities, as well as cultural excursions, romantic dinners for two and one-of-a-kind island experiences from guided snorkeling and scuba diving trips, and sunset dolphin cruises to cinema experiences, and castaway picnics. Unique experiences include personal guided tours with marine biologists and learn more about the magnificent reefs surrounding the island and the aquatic creatures that reside on them; private picnics on the deserted island of Embudhoo; weekly cinema nights beneath the stars, complete with popcorn, drinks and comfortable beach-bag chairs; and sunset cruises on traditional dhonis as the sun sinks below the horizon. Other exclusive Coco Palm Dhuni Kolhu experiences include joining the island fishing crew to catch dinner; watching wild Bottlenose dolphins on dolphin-watching cruises; picking your ingredients for a sumptuous organic dinner; along with power boating, jet skiing, snorkeling, water skiing, surfing, parasailing, big game fishing, wake, and knee-boarding. 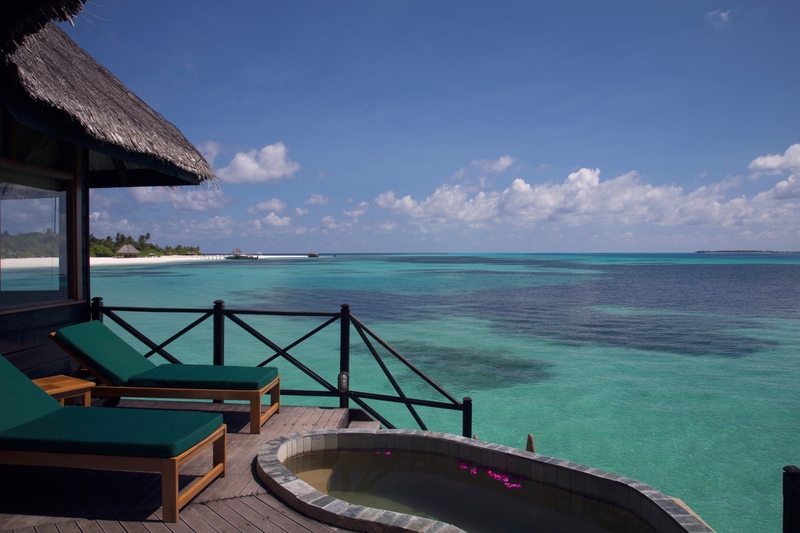 Coco Palm Dhuni Kolhu provides beautiful locations for tying the knot or renewing vows. The resort’s wedding and vow-renewal experiences are ceremonial rather than legal commitments and designed to express passion and love in a magical destination. Designed for an all-inclusive experience of a lifetime, the resort offers a selection of wedding and honeymoon packages for all budgets and tastes.